By the time he began writing his second novel, The Book of Night Women, about a slave revolt on an 18th-century Jamaican sugar plantation, James was “full set that I was going to write my way out of Jamaica. My ambitions when I moved to the States were pretty simple: I just wanted to not kill myself.” When he was offered a teaching position at Macalester, a small liberal-arts college in St. Paul, Minnesota, he immediately accepted. And what about his educaton? I know that famous authors sometimes teach at liberal arts colleges (David Foster Wallace taught at Pomona, after all), but Morris doesn’t give the impression that James was a big writing star when he got the position. Wouldn’t he need at least a master’s degree (even David Foster Wallace had an M.F.A.)? Let’s see what Morris says about this: “College at the University of the West Indies, where he studied literature and politics and fell in with creative types, was a reprieve, but after he graduated and got a job in advertising, the old insecurities returned.” Hmm. Curious about this, I decided to check out James’s Macalester bio. Surprise! James isn’t just a “teacher,” he is an Associate Professor of English. His bio also states that he “graduated from the University of the West Indies in 1991 with a degree in Language And Literature, and from Wilkes University in 2006 with a Masters in creative writing.” So it appears that James didn’t so much “write his way out of Jamaica” as “got an advanced degree and a corresponding job,” though I’m sure that the publication of his second book in 2009 helped with the transition to a tenure-track position. So, to recap, James earned a Master’s degree and got a one-year position at a highly-ranked liberal arts college and then, at some point, not only transitioned to a tenure-track position but received tenure. Readers of Morris’s article, however, could easily presume that James earned a bachelor’s degree and became a “teacher” at a liberal arts college, since anybody can teach at liberal arts colleges and there is nothing else that professors do (if he even is one!). When an entire article can be written about a tenured college professor without even mentioning that he is anything other than a “teacher” it is no wonder that Americans have a poor understanding of what professors do! 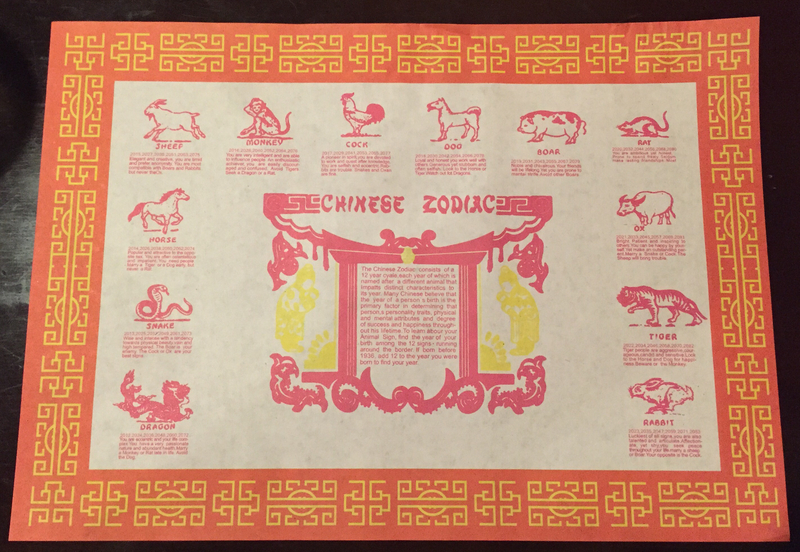 If you have ever eaten at a Chinese restaurant, you may be familiar with the placemat pictured above. 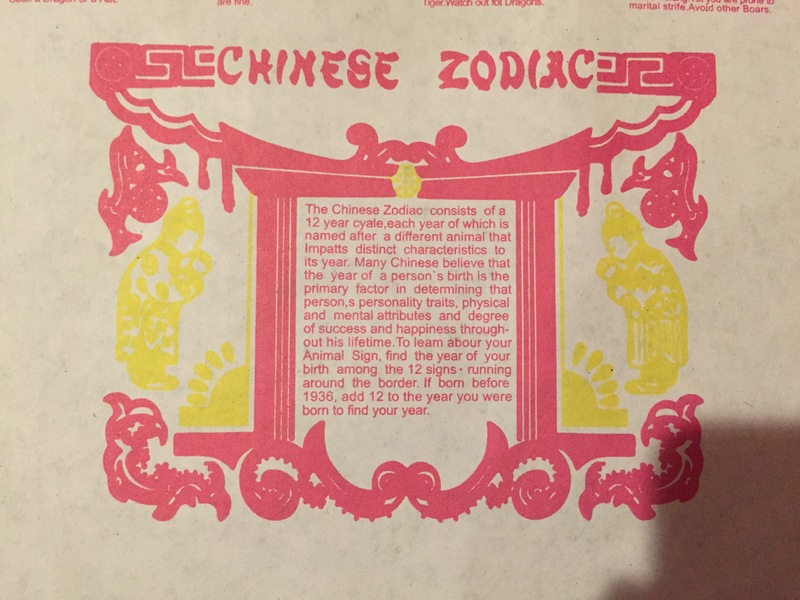 It depicts the Chinese Zodiac, represented by twelve animals, which is based on the year in which you are born and, like other zodiacs, purports to provide insight into your character based on that information. I’ve looked at this placemat, or at least placemats like it, countless times while waiting for my food, frequently discussing which qualities seem “true” and which seem “false” and commenting on how funny I think it is that my sister is a dog. 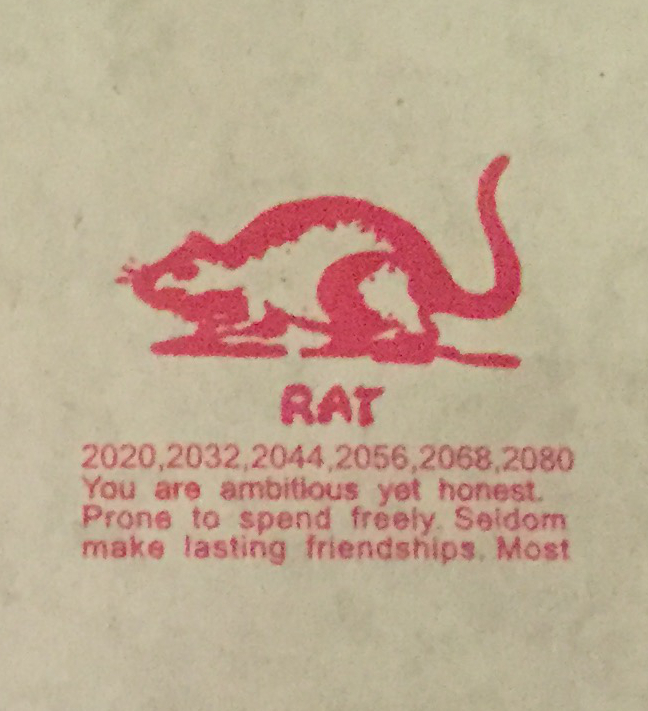 My most recent visit to a Chinese restaurant was on a particularly busy night, so I had a long time to ponder this placemat. 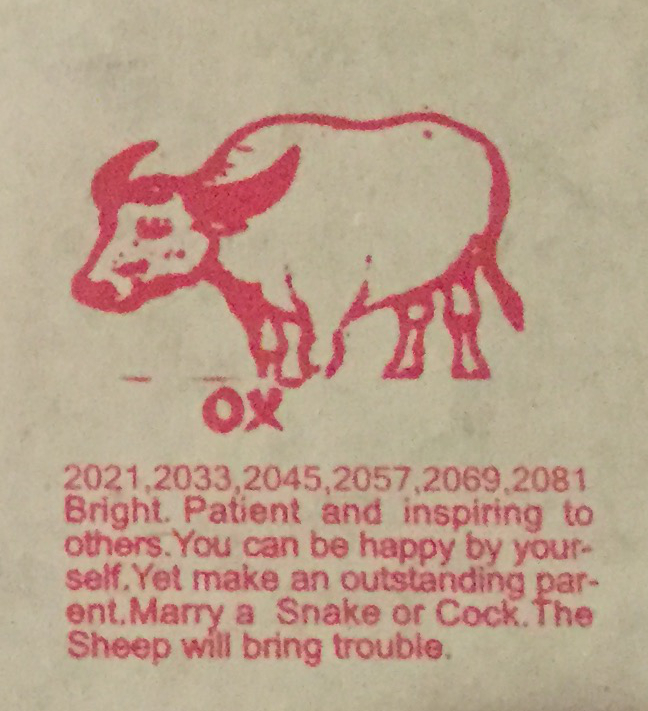 This led to the discovery that quality control at the Chinese Zodiac Placemat factory has taken a serious downturn since I last paid attention to their work. 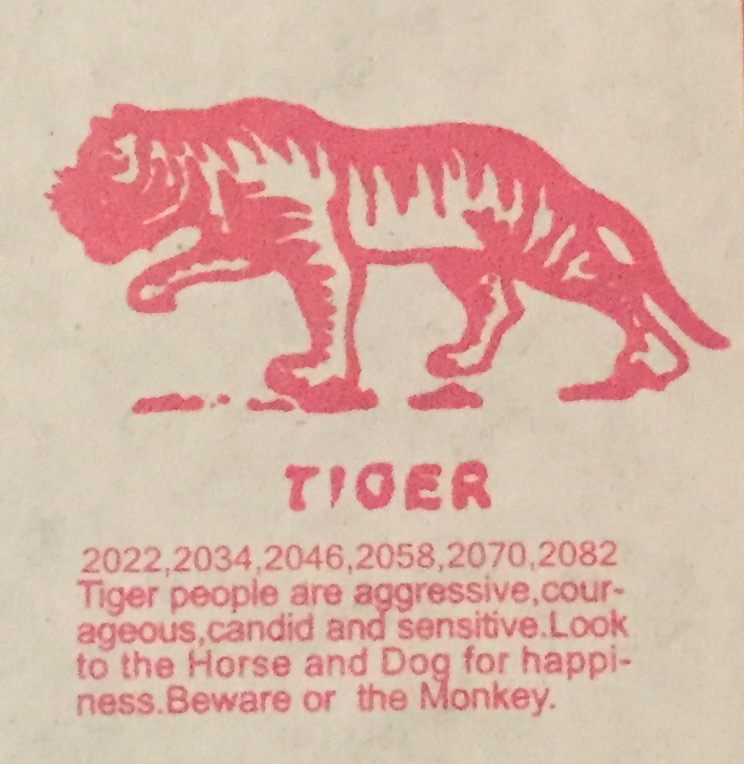 The Chinese Zodiac consists of a 12 year cyale,each year of which is named after a different animal that Impatts distinct characteristics to its year. Many Chinese believe that the year of a person’s birth is the primary factor in determining that person,s personality traits, physical and mental attributes and degree of success and happiness throughout his lifetime. To leam abour your Animal Sign, find the year of your birth among the 12 signs [floating dot] running around the border. If born before 1936, add 12 to the year you were born to find your year. Other than some kerning issues and a missing period, the text isn’t bad. But note the years. 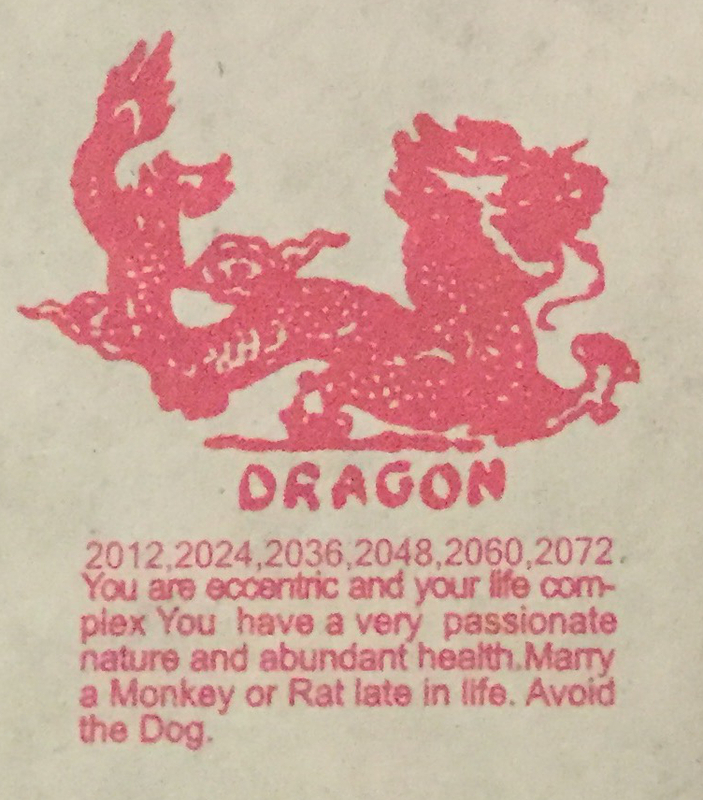 The dragon is the first animal in the Chinese Zodiac, meaning that 2012 is the earliest somebody could be born in order to easily find their animal. Unlike anybody who will be born in the next 68 years, somebody born in the 1980s is out of luck. 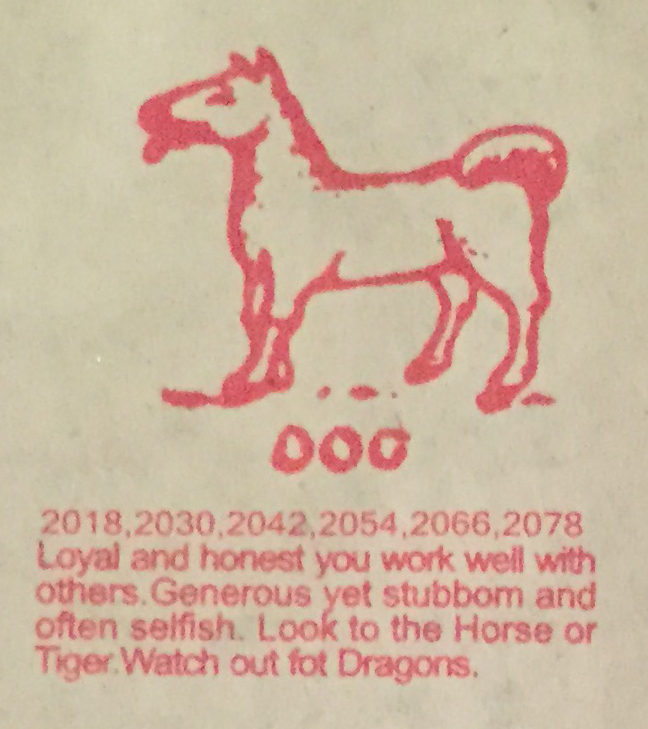 It appears that instead of updating the placemat to end with those born in 2012, it was instead updated to begin with those born in 2012 (maybe the person in charge of quality control at the Chinese Zodiac Placemat factory thought the world would end so none of this mattered?). In general, things get worse as you go around the placemat. 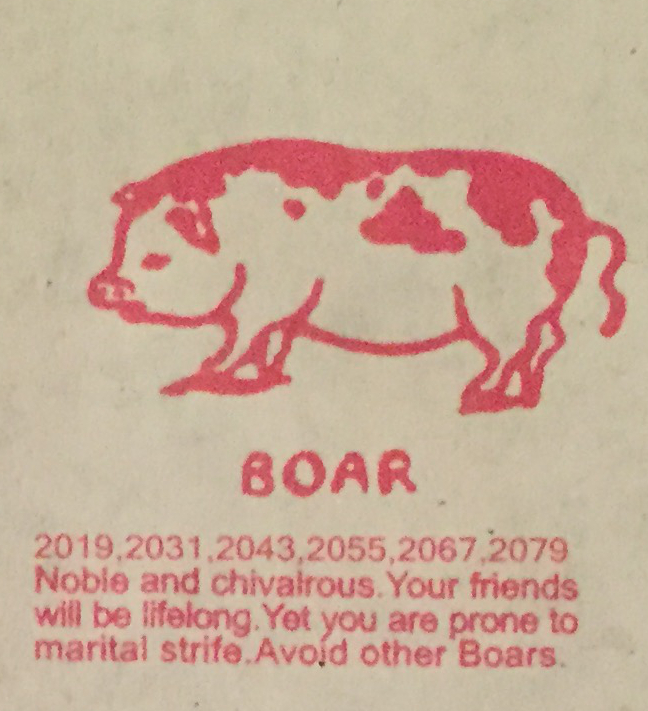 Boars, for example, are told to avoid others born in the same year but left wondering which animals they should seek. Then we get to the rat and the wheels basically fall of. Most what?! Our final stop on today’s tour is the tiger. I have worked hard to ignore how contradictory these descriptions tend to be. I think that the basic formula is to give each animal a few good qualities and a few bad qualities, so that they can see the good qualities in themselves and the bad qualities in others. In any event, beware or the Monkey, Tiger! I have no idea how long the restaurant I visited has been using this placemat or how many they have left in stock, but I think it may be time to spend a bit more to purchase from a company whose placemat quality control person has not completely given up. I’m also left wondering if it is possible that a Chinese restaurant has resorted to using a cheap Chinese knockoff of a similar (but error-free) placemat. How meta of them? “Like” Memoirs of a SLACer on Facebook to receive updates and links via your news feed. With this post and the previous post about Valentine’s Day cards, it is basically like a cheap knockoff of Sociological Images!